To commemorate Martin Luther King Day, Marc spoke today with participants of The Civil Rights and Historical Education Tour. The tour included lectures and interviews with leaders and participants in the civil rights movement, stopping in Birmingham, Montgomery, and Selma. To commemorate Martin Luther King Day, Marc spoke today with participants of The Civil Rights and Historical Education Tour. 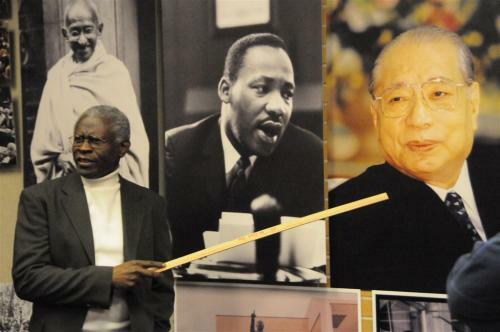 The tour included lectures and interviews with leaders and participants in the civil rights movement, stopping in Birmingham, Montgomery, and Selma. Today’s guests represent the diversity of the tour group, who joined the trip from all over the country to learn more about the history of race and equality in America. Lea Gilmore is the Director of Pride in Faith, and Program Director of the Maryland Black Family Alliance. You can read her article about the trip on the Maryland Commons website. Pam Zappardino and Charles Collyer are co-founders and co-directors of the Ira and Mary Zepp Center for Nonviolence and Peace Education. Patrice Forrester is a first year graduate student at Catholic University. Cliff de Mesquita is a high school Junior from Rhode Island. The Civil Rights and Historical Education Tour was sponsored by the University of Rhode Island’s Center for Nonviolence and Peace Studies and the Ira and Mary Zepp Center for Nonviolence and Peace Education at McDaniel College in Westminster, MD.